S.M.A.R.T. (self-monitoring, analysis, and reporting technology) is a monitoring system for storage devices that provides some information about the status of the drive as well as the ability to run self-tests. The intent of S.M.A.R.T. is for the drive to collect presumably useful information on the state or condition of the drive, with the idea that some of this information can be used for predicting impending drive failure. The S.M.A.R.T. standard was based on previous work by various drive manufacturers to provide health information about their drives. The information was specific to the manufacturer, making life difficult for everyone, so the S.M.A.R.T. standard was developed to provide a set of specific metrics and methods that could be communicated to the host OS. The original standard was very comprehensive, with standard data for all devices, but the final standard is just a shadow of the original. For a drive to be considered “S.M.A.R.T.” all it has to have is the ability to signal between the internal drive sensors and the host system. The standard provides no information about what sensors are in the drive or how this data is exposed to the user. At the lowest level, S.M.A.R.T. provides a simple binary bit of information – the drive is OK or the drive has failed. This bit of information is called the “S.M.A.R.T. status.” The drive fail status doesn’t necessarily indicate that the drive has actually failed but that the drive might not meet its specifications. Whether this means the drive is about to fail (i.e., not work) is really up to the drive manufacturer, so S.M.A.R.T. is not a panacea. In addition to the S.M.A.R.T. 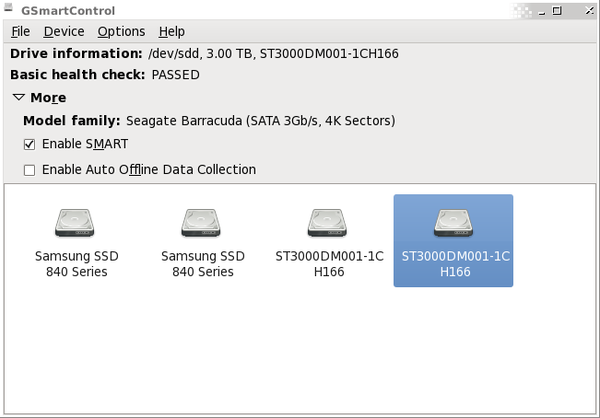 status, virtually all drives provide additional details on the health of the drive via S.M.A.R.T. attributes. These attributes are completely up to the drive manufacturers because they are not part of the standard, which is even more obvious when comparing spinning drives to solid state drives, which have very different characteristics and health information. Therefore, each type of drive has to be scanned for various S.M.A.R.T. attributes and possible values. In addition to S.M.A.R.T. attributes, the drives can also contain some self-tests with the results stored in the self-test log. These logs may be scanned or read to track the state of the drive. 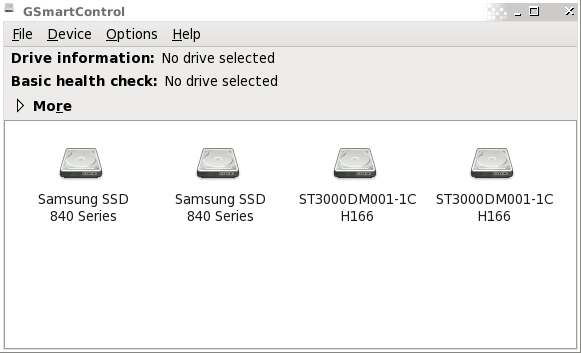 Moreover, you can also tell the drives to run self-tests. Attributes have a threshold value beyond which the drive will not pass under ordinary conditions (sometimes lower values are better and sometimes larger values are better), so the attributes are difficult to read. These threshold values are only known to the manufacturer and might not be published. Additionally, each attribute returns a raw value, the measurement of which is up to the drive manufacturer, and a normalized value that spans from 1 to 253. A “normal” attribute value is completely up to the manufacturer as well. It’s not too difficult to get S.M.A.R.T. attributes from various drives, but it’s easy to interpret the values. The S.M.A.R.T. Wikipedia article has a pretty good list of common attributes and their meanings. All of the features and capabilities of S.M.A.R.T. drives sound great but how does one collect S.M.A.R.T. attribute information or control drive self-tests and obtain the logs? Fortunately for Linux types, an open source project, smartmontools, allows you to interact with the S.M.A.R.T. data in drives on your systems. Using this tool, you can query the drives to gather information about them, or you can test the drives and gather logs. This kind of information can be an administrator’s dream because it can be used to keep track of the system configuration, as well as the state of the drives (more on that later). Smartmontools is compatible with all S.M.A.R.T. features and supports ATA/ATAPI/SATA-3 to -8 disks and SCSI disks and tape devices. It also supports the major Linux RAID cards, which can sometimes cause difficulties because they require vendor-specific I/O control commands. Check the smartmontools page for more details on your specific card. For this article, I’ll be using a freshly installed CentOS 6.4 distribution on a newly built system with smartmontools installed using yum. I also made sure the smartmontools daemon, smartd, starts with the system by using chkconfig smartd on. I will illustrate some things that smartmontools can do by exploring two types of drives in my system. The first is a Samsung 840 SSD (120GB), and the second is a Seagate Barracuda 3TB SATA drive. I want to test both types of drives so you can see how the output differs, particularly for SSDs that don’t have rotating media. Notice that the command for using smartmontools is smartctl. As this output shows, the drive is S.M.A.R.T. capable, but not in the smartmontools database. Recall that the S.M.A.R.T. attributes can vary from one vendor to another. The smartmontools community contributes information to the database for various drives so that other people can use the information. 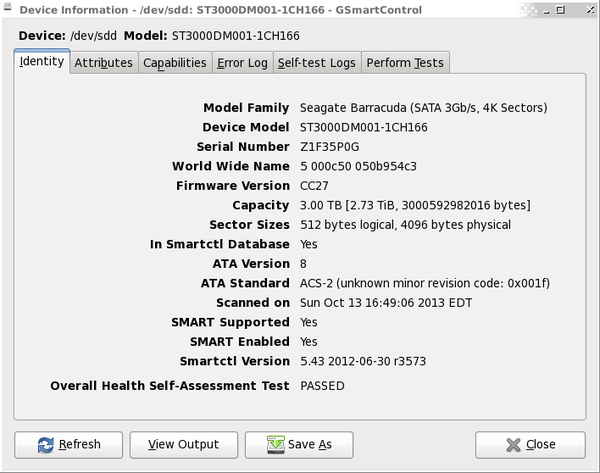 Even though this device is in the database, using the command, smartctl -P show doesn’t show anything (i.e., there are no presets for the drives, that is, no preset S.M.A.R.T. output information). You can see that both drives pass their overall health self-assessment. If the output says FAIL, your best bet is to copy immediately all data from that drive and take it out of service. Although the drive might be able to function for some time, you can’t be sure, so it’s best to get the data off of that drive immediately. As an administrator of an HPC system, you could put this health status check in a cron job to run periodically. You could even create a metric as part of a monitoring tool, such as Ganglia, to show the status of all of the drives, either in a central storage system or in the compute nodes. data collection: ( 584) seconds. recommended polling time: ( 344) minutes. The Seagate has more attributes than the Samsung SSD. If you read through the list, some might look alarming. For example, under TYPE you see some things listed as Pre-fail, which does not mean the drive is getting ready to fail; it means the drive has not “failed” that category. Also note that because an attribute might be listed as “failed” at some point, that does not mean the drive really has failed. Whether the drive has failed is up to the drive manufacturer. The first attribute, Raw_Read_Error_Rate, is the rate of hardware read errors that occurred when reading data from a drive. The value of the attribute is 117, its worst value is 99, and the threshold is 006. Does this mean the read error rate is 117 when the threshold is 6? Not necessarily, because the absolute values being examined are meaningless without knowing their definitions. What you should do is track that attribute and see when or if it changes. One thing S.M.A.R.T. can do is run self-tests on drives. Even though the self-test details are manufacturer dependent, they can be useful, because at least they cause the drives to do some sort of testing to determine whether they are “OK” or not. S.M.A.R.T. performs two main tests – a short self-test and a long self-test – which you can schedule in a cron job. The first option “turns on” S.M.A.R.T., and the second stores the results between reboots. The lowercase -s on enables S.M.A.R.T. on a particular device (/dev/sdb in this case). The uppercase -S on tells the device to save the S.M.A.R.T. attributes between power cycles. Sending command: ”Execute SMART Short self-test routine immediately in off-line mode”. Drive command ”Execute SMART Short self-test routine immediately in off-line mode” successful. You really want to see the message, Completed without error in the output. Sending command: ”Execute SMART Extended self-test routine immediately in off-line mode”. Drive command ”Execute SMART Extended self-test routine immediately in off-line mode” successful. Please wait 344 minutes for test to complete. Again, the test completed without error. This type of test can, in principle, degrade the device performance. The ‘-o on’ option causes this offline testing to be carried out, automatically, on a regular scheduled basis. Normally, the disk will suspend offline testing while disk accesses are taking place, and then automatically resume it when the disk would otherwise be idle, so in practice it has little effect. To run offline tests, you use the -o on option with smartctl, and it us up to you whether to run the tests are not. My recommendation is that if the storage devices are likely to be busy, as they would be in a storage system, then you might not want to run the offline tests. However, if the drive is in a compute node or a workstation with idle device usage periods, then you might want to run the tests. Is S.M.A.R.T. Useful or Not? With S.M.A.R.T. attributes, you would think that you could predict failure. For example, if the drive is running too hot, then it might be more susceptible to failure; if the number of bad sectors are increasing quickly, you might think the drive would soon fail. Perhaps you can use the attributes with some general models of drive failure to predict when drives might fail and then work to minimize the damage by moving data off of the drives before they actually fail. Although a number of people subscribe to using S.M.A.R.T. to predict drive failure, its use for predictive failure has been a difficult proposition. Google published a study that examined more than 100,000 drives of various types for correlations between failure and S.M.A.R.T. values. The disks were a combination of consumer-grade drives (SATA and PATA) with speeds from 5,400rpm to 7,200rpm and drives with capacities ranging from 80GB to 400GB. The data in the study was collected over an eight-month window. Google agrees with the common view that failure rates are known to be highly correlated with drive models, manufacturers, and age. However, when they normalized the S.M.A.R.T. data by the drive model, none of the conclusions changed. Temperature effects are interesting. High temperatures start affecting older drives (three to four years or older), but low temperatures can also increase the failure rate of drives, regardless of age. The paper tried to sum up all the observed factors that contributed to drive failure, such as errors or temperature, but they still missed about 36% of the drive failures. The paper provides good insight into the drive failure rate of a large population of drives. As mentioned previously, drive failure correlates somewhat with scan errors, but that doesn’t account for all failures, of which a large fraction did not show any S.M.A.R.T. error signals. It’s also important to mention that the comment in the last paragraph mentions that, “… SMART models are more useful in predicting trends for large aggregate populations than for individual components.” However, this should not keep you from watching the SMART error signals and attributes to track the history of the drives in your systems. Again, there appears to be some correlation between scan errors and failure of the drives, and this might be useful in your environment to encourage making copies of critical data or decreasing the time period between backups or data copies. In HPC systems, you like to get quick answers from monitoring tool to understand the general status of your systems. You can do this by writing some simple scripts and using the smartctl tool. In fact, it’s a simple thing you can do to improve the gathering of data on system status (Google used BigTable, their NoSQL database, along with MapReduce to process all of their S.M.A.R.T. data). Remembering all the command options and looking at rows of test can be a chore sometimes. If your systems are small enough, such as a workstation, or if you need to get down and dirty with a single node, then GSmartControl is a wonderful GUI tool for interacting with S.M.A.R.T. data. I won’t take too much time to talk about GSmartControl or how to install it, but I do want to show you some simple screenshots of the tool. Figure 1 shows the devices it can monitor. Figure 1: GSmartControl start screen. You can see that this system has four storage devices. Clicking on a device (/dev/sdd) and More shows more information (Figure 2). Figure 2: Information about /dev/sdd. You can see that S.M.A.R.T. is enabled on the device and that it passed the basic health check. If you double-click the device icon, you get much more information (Figure 3). Figure 3: Drive detail dialog box. This dialog box has a myriad of details and functions available. The tabs supply information about attributes, tests, logs, and so on, and you can launch tests from the Perform Tests tab. S.M.A.R.T. is an interesting technology as a standard way of communicating from the OS to the drives, but the actual information in the drives, the attributes, is non-standard. Some of the information between manufacturers and drives is fairly similar, though, allowing you to gather some common information, but because S.M.A.R.T. attributes are not standard, smartmontools might not know about your particular drive (or RAID card). It may take some work to get it to understand the attributes of your particular drive. S.M.A.R.T. can be an asset for administrators, and home users. Probably its best role is to watch the history of storage devices. Simple scripts allow you to query your drives and collect that information, either by itself or as part of a monitoring system, such as Ganglia. If you want a more GUI-oriented approach, GSmartControl can be used for many of the smartctl command-line options.